He’s worked on archaeological sites all over the country, including the Rathcroghan complex in Co Roscommon, reputed to be the seat of Queen Maeve of Connacht, the world heritage site at Newgrange, and the Beltany Stone Circle just outside Raphoe, as well as Viking sites in Norway. Now he’s come to Gleann Cholm Cille, home of some of the most spectacular megalithic and early Christian sites in Ireland, including several court cairn tombs and dolmen complexes, as well as the celebrated Turas Cholm Cille, travelled by pilgrims every June on the anniversary of the saint’s death. Station number two is an incised cross-slab dramatically perched on a rocky outcrop about 50 metres west of St Columba’s Church of Ireland. Somewhere around here may lie the evidence showing just how long this has been a site of worship. In other words, the research is groundbreaking because it doesn’t break up the ground. The idea is to draw a survey grid over what appears to be plain fields, and see what secrets lie below the surface, he explains. ‘We don’t know where it could be, if its in close, or something bigger. Some monastic monastic enclosures can be 11 or 12 hectares in size, some of them can be as small as 30 or 40 square metres. While Igor worked with some complicated-looking space age equipment, Kevin Barton listed the clues that told archaeologists an area could be a monastic site. Colmcille’s well, about a mile away on the slopes of Glen Head, could still be part of the site in the centre of the valley, he added. The geophysical survey could answer that question. Kevin Baron worked in NUI Galway for about 20 years, before he left in 2001 to set up his own company, Landscape and Geophysical Services, based in Claremorris in Co Mayo. 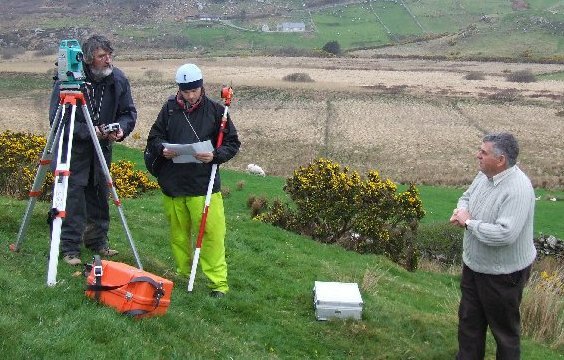 The geophysical survey he is conducting is funded by the Heritage Council of Ireland, along with help from the local community. Local man and project manager Seamus McGinley told me that the project couldn’t have got off the ground without the help of the Heritage Council. ‘They see doing geophysical surveys as a way of helping local communities to investigate their local heritage, because there’s no excavation,’ he said. ‘Cost wise, this is cheaper than doing an excavation, as well as being non-destructive. We’re not digging holes in the ground or anything like that, just putting a few things in the ground and taking a few measurements. ‘We’ve had excellent co-operation from local farmers and landowners, and the Church of Ireland rector and community, everyone is very excited about the survey,’ he added. Kevin Barton will be finished with his survey by the end of the week, and will return to Gleann Cholm Cille to give a presentation at the end of August during Heritage Week outlining his findings. ‘If the project is successful, then we hope to progress to projects on other sites with Comhairle Oidhreachta support,’ says Liam Ó Cuinneagáin of Oideas Gael. 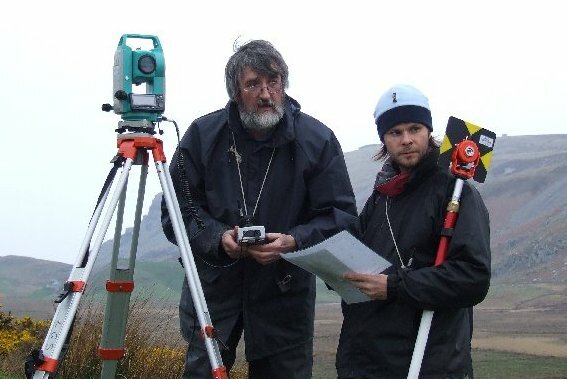 The work, making the use of the latest scientific survey equipment, builds on the pioneering studies of University College Dublin Professor Michael Herity, who was first invited to the parish by Fr James McDwyer in 1970, and carried out a survey and analysis of the monuments in the parish. The professor emeritus still teaches a course on the archaeology of the area at Oideas Gael every Summer.